You are also a pro-choice Catholic, and I was reading some stories out of your home state recently where one of the bishops took an action. Can you tell us a little bit about that? Well, the Archbishop in the Kansas City area did not approve of my conduct as a public official and asked that I not present myself for communion. Well, it was one of the most painful things I have ever experienced in my life, and I am a firm believer in the separation of church and state, and I feel that my actions as a parishioner are different than my actions as a public official and that the people who elected me in Kansas had a right to expect me to uphold their rights and their beliefs even if they did not have the same religious beliefs that I had. And that’s what I did: I took an oath of office and I have taken an oath of office in this job and will uphold the law. 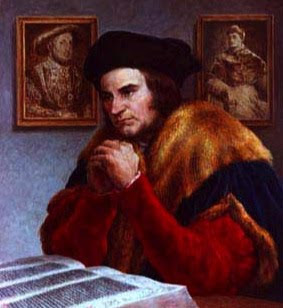 St. Thomas More was born at London in 1478. After a thorough grounding in religion and the classics, he entered Oxford to study law. Upon leaving the university he embarked on a legal career which took him to Parliament. In 1505, he married his beloved Jane Colt who bore him four children, andwhen she died at a young age, he married a widow, Alice Middleton, to be a mother for his young children. A wit and a reformer, this learned man numbered Bishops and scholars among his friends, and by 1516 wrote his world-famous book “Utopia”. He attracted the attention of Henry VIII who appointed him to a succession of high posts and missions, and finally made him Lord Chancellor in 1529. However, he resigned in 1532, at the height of his career and reputation, when Henry persisted in holding his own opinions regarding marriage and the supremacy of the Pope. The rest of his life was spent in writing mostly in defense of the Church. In 1534, with his close friend, St. John Fisher, he refused to render allegiance to the King as the Head of the Church of England and was confined to the Tower. Fifteen months later, and nine days after St. John Fisher’s execution, he was tried and convicted of treason. He told the court that he could not go against his conscience and wished his judges that “we may yet hereafter in heaven merrily all meet together to everlasting salvation.” And on the scaffold, he told the crowd of spectators that he was dying as “the King’s good servant-but God’s first.” He was beheaded on July 6, 1535. His feast day is June 22nd.